Designed to disperse feed in defined areas such as along roads, trials or ponds, the Moultrie Quick-Lock Directional Tripod Feeder assembles without tools and features an agitating spinner plate that breaks up clumps for reliable operation. 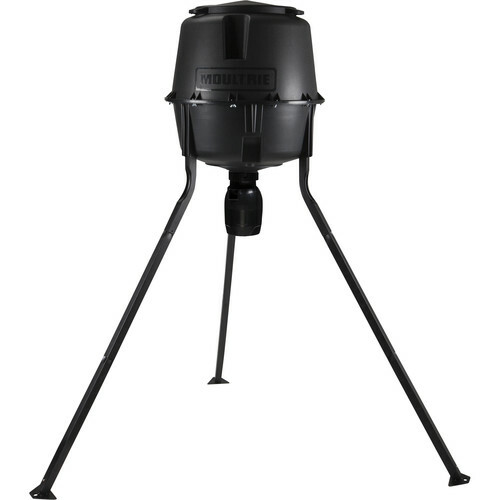 The 30-gallon hopper connects to the feeder mechanism with Moultrie's no-tools-needed Quick-Lock system. Feed is dispensed up to six times per day, at 1-20 seconds per feeding, in a 30° range. The feeder runs on one user-provided 6V battery, but can also be powered by Moultrie's 6V Deluxe Solar Panel or Feeder Power Panel, both sold separately. Box Dimensions (LxWxH) 25.0 x 18.6 x 18.6"